It may sound a bit cliché, but it’s true… if you can dream it, Robare Custom Homes can design it and build it! Robare Custom Homes has assembled an amazing team of designers and trade professionals who will listen closely to wants and desires in every aspect of design. From your own vision they will bring to life the completely unique, custom home of your dreams. The term Design Build means that we form our team at the start of your project and everyone works toward the same goals. While we have built many custom homes for clients who already had an architect or designer create the plans, and happy to do so, it is still preferable to work as a team from the start involving the key contributors – architect/designer and builder. Architects and Designers know the costs to design the home and builders know the costs to build. Working together helps accomplish the most important goal – to get your new custom home built with a design you love at a price within your budget. Unsure of what you want? Rest assured that Robare Custom Homes team can provide you with ideas to create a home you will be thrilled to call your own! Expect nothing less than hands-on, personalized attention from our entire team. Your happiness and satisfaction is our utmost concern in every aspect of designing and building your home. Robare Custom Homes is a Certified Green Builder and Energy Star Builder. 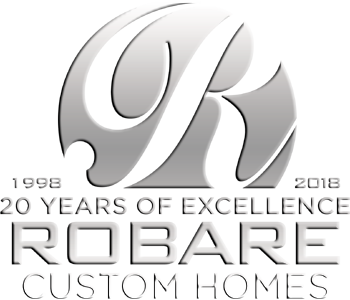 Robare Custom Homes uses only quality materials in every facet of the construction phase of your new custom home. We are constantly upgrading our company standards as technology continues to grow, so you can feel confident you are receiving the best of what is available in the building industry at any given time. 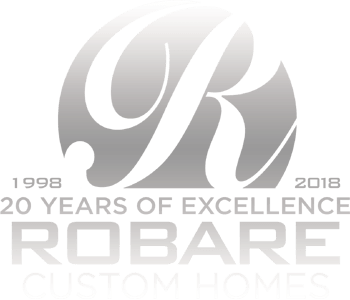 Mike’s and his team’s exceptional eye for detail allows Robare Custom Homes to provide clients with a 2 Year Warranty on any defects of services provided by Robare Custom Homes and a 10 Year Structural Warranty. When you choose Robare Custom Homes, you can feel confident knowing you have selected a Premier Custom Homebuilder dedicated to consistent quality with your best interests in mind.